The Minnesota Lynx’s extra work last week paid off with a with a win. Now Cheryl Reeve’s team will try go back to back. 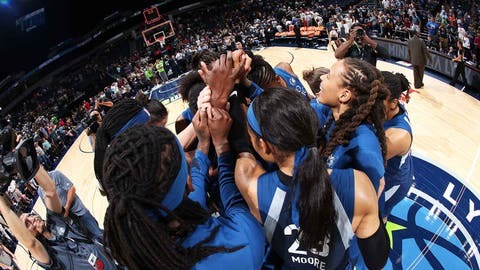 The Lynx (4-6), who have won two in a row just once in the season’s first 10 games, host the Dallas Wings (5-4) on Tuesday at the Target Center in Minneapolis. One win, Reeve said, won’t strike fear in the hearts of opponents. Minnesota will have to contend with the Wings’ inside-outside duo of Liz Cambage, the WNBA’s second leading rebounder (10.8 per game), and Skylar Diggins-Smith, who is tops in the league at 21.9 points per game. Cambage likely remembers the last time she faced Minnesota center Sylvia Fowles, who leads the league in rebounding again this year. The reigning MVP had 23 points and 20 rebounds in a 76-68 Lynx win on May 23. Playing without Seimone Augustes on Saturday, Minnesota got 45 points from its biggest stars, Fowles and Maya Moore. Moore had 20 points, six rebounds and four assists. “That’s what we need from them, as the go-to players,” Reeve said. Dallas is coming off a 78-68 win over Las Vegas in which Cambage certainly wasn’t looking ahead to Tuesday’s matchup. The Wings center tied a career high (28 points) and set another (18 rebounds) in the win. It was the fourth in five games that Cambage has topped 20 points. The 6-foot-8 Australian returned to the WNBA this season after five years playing abroad.